One of the toughest tasks that handicappers face today, especially in light of all the turf and synthetic races carded on a daily basis, is estimating what the pace of a race is likely to be. Will the frontrunners rush to the front in an all-out sprint for early supremacy or hold back like kids in line for a flu shot? In last Saturday’s Fountain of Youth Stakes, the former approach was on display, as Majestic Hussar rocketed to the front and recorded a -13 early speed ration, carving out an opening half-mile in 45-2/5 seconds. Of course, after the race, when it was discovered that the 3-5 favorite Violence had fractured his right front medial sesamoid and is no longer on the Kentucky Derby trail, many theorized that the swift Fountain of Youth pace contributed to his demise. Yet, it is my contention that the -13 Fountain of Youth ESR was not only a non-surprise, it was predictable. In fact, I’m going to show you an easy and reasonably accurate (hey, you can’t expect easy and infallible, can you?) method for determining the probable pace of a race. Now, as you probably guessed, I’m going to use my proprietary speed rations to do it… but don’t be discouraged by that fact. I am only using my numbers to draw measurable conclusions. From a handicapping standpoint, the important thing is discerning whether the pace figures to be fast, normal or slow — which is something my ESRs can readily tell us. In fact, the crux of this method lies in a different set of digits altogether — the Quirin speed points found in Brisnet’s Ultimate and Premium Plus past performances or detailed by the man himself in “Winning At the Races.” The concept is simple: Just total up all the Quirin speed points in a given race and divide by the number of horses that earned them (first-time starters or horses with zero points should be ignored). Then use the equations derived from my database studies (below) to forecast today’s ESR. Because the ESRs are relative, i.e. they are not speed figures, one can instantly get a grasp of how the race is likely to be run once they have been obtained. Let’s go back to last weekend’s Fountain of Youth Stakes and put this simple pace method to the test. 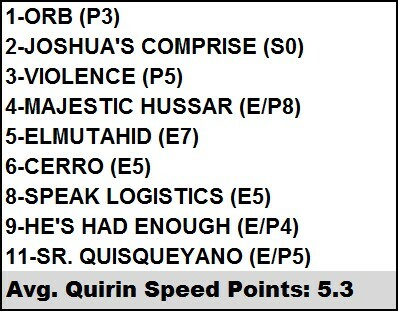 Eight horses (Joshua’s Compromise wasn’t considered — see above) combined to earn 42 Quirin speed points, good for a race rating of 5.3 (42/8= 5.3). ESR(y)= -0.5877 * 5.3(x) – 7.0519, or -10. A -10 ESR, as noted above, constitutes a “brisk” pace. Yeah, in real life, the Fountain of Youth pace turned out to be a little faster than that (almost “demanding”), but we’re in the ballpark. And that’s all this method is attempting to do — give us a general idea as to how fast, relatively speaking, the pace will be. With this knowledge, we might have concluded that horses able to rate off the early fractions — horses like Orb, Joshua’s Compromise, Violence and, to a lesser degree, He’s Had Enough and Sr. Quisqueyano — would have an advantage in Saturday’s Gulfstream Park feature. And we’d have been right. Orb rallied from eight lengths off the pace to catch a leg-weary Violence in the final strides, while Speak Logistics, a frontrunner that has been attempting to rate in recent races, rallied to finish third. Try this method on other races and see what you think. Hopefully, it will help you more accurately assess the pace picture of the races you bet on, which should help your ROI… and your peace of mind. Very interesting, thanks for posting...will definitely look to study it further. Why did you multiply by 5.25 instead of 5.3? I need to change that Larry. I just rounded in one instance and not in another. The other thing I noted on my Facebook page -- and I'll look into this further -- is to examine, say, the top 3-4 top Quirin point-getters and use THEM as the basis of the pace assessment. Derek, this is really helpful. Thanks for the explanation. I have one quick question. The formula for Turf Routes adds the final amount (0.1399) to the calculated figure. Is this correct? The reason I ask is that in all the other formulas, the final amount is subtracted from the calculated figure. Thanks.